Process garlic and nuts until finely chopped. Add rocket, oil & lemon juice and process until smooth. 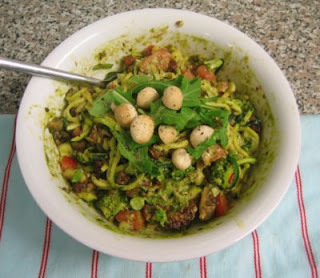 Place the pasta ingredients into a bowl and add Pesto and stir. You can then place it into a dehydrator for about 1 hr stirring every 20 mins until warmed through and the veggies have softened. If you don't have a dehydrator you can place in the sun or just not worry about it! Mix all ingredients together that place into a sterilised jar and let sit for about 24hrs before refrigeration.